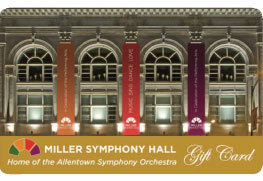 Miller Symphony Hall Gift cards are the perfect gift for any occassion! Surprise the music lovers in your life with a gift card today! • Gift Cards are convenient and easy to purchase. • The perfect way to please even that hard-to-buy-for person. • You choose the amount, they choose the show.